The National Milk Producers Federation (NMPF), the U.S. Dairy Export Council (USDEC), the International Dairy Foods Association (IDFA) and the National Association of State Departments of Agriculture (NASDA) are calling the issue "one of the most sensitive and urgent topics complicating the relationship between the two countries." The White House will host Trudeau in Washington today to discuss matters related to trade policy and the renegotiation of NAFTA, among other issues. 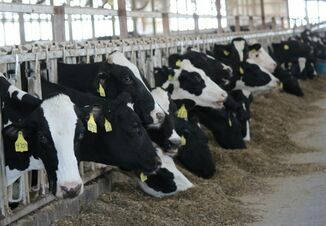 According to the four groups, the two leaders need to devote time to addressing an imminent change in Canada's milk pricing policy that would further antagonize industry relations between the United States and Canada. 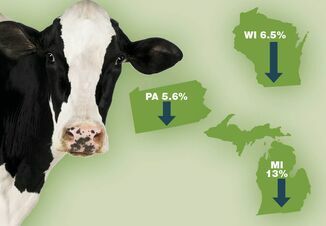 The pricing scheme, already implemented in Ontario last year and slated to be used by Canada's other provinces this year, is expressly intended to slash milk imports from the United States. The policy will also enable Canada to sell dairy ingredients below cost in international markets, in effect dumping the product at below cost in competition with U.S. dairy exports. The Ontario program has already cost U.S. companies $150 million in exports, thereby harming the American dairy farmers, dairy plant employees and rural communities that depend on the benefits of those foreign sales. Implementation of this pricing measure "comes at a time when compliance with the letter and spirit of trade agreements is of paramount importance, both here in Washington and around the world," said NMPF President and CEO Jim Mulhern. "Despite this, Canada still wants to move ahead with a policy that clearly violates its trade agreements with our country. We hope President Trump will remind Prime Minister Trudeau how important it is that Canada honor its commitments." The importance of U.S.-Canada trade issues was also raised last week in a meeting between House Speaker Paul Ryan and Canadian Foreign Minister Chrystia Freeland. 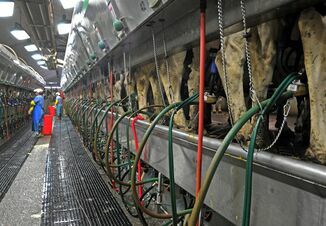 Tuesday that dairy market access is a key issue the two nations must improve upon. Tom Vilsack, president and CEO of USDEC, said "American dairy producers and processors want a fair and level trade relationship, and have deep concerns about proposed changes to the Canadian supply-side management system, which are designed, in part, to discourage U.S. exports." Michael Dykes, D.V.M., president and CEO of IDFA noted: "Canada's intentional and continued flouting of its trade obligations effectively blocks imports of U.S. ultra-filtered milk. What's more, existing Canadian tariffs that range from 200 percent to more than 300 percent on other U.S. dairy products are unacceptable. Exports are vitally important to the health of the U.S. economy, especially in the rural heartland of our country, and we urge President Trump to stress the importance of market access for U.S. dairy products during his meeting with Prime Minister Trudeau." The organizations believe that this meeting between President Trump and Prime Minister Trudeau offers an ideal opportunity for the dairy pricing policy to be on the table during their discussion. "The states are deeply troubled by recent actions taken in Canada, at the provincial and national level, which raise serious concerns about Canada's compliance with international trade obligations," said NASDA CEO Dr. Barbara P. Glenn. "We encourage President Trump to make this a top priority for his administration and we urge Prime Minister Trudeau to ensure Canada meets its obligations." with Trump last month before he assumed office. Hay School for Livestock Producers is March 18 in Kirksville, Mo.